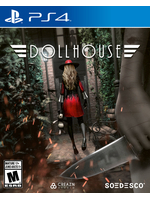 Announced last year for PC, noir horror game Dollhouse from Creazn Studio will also hit PS4 in 2016 with a closed beta coming soon. Playing as Marie, a detective, you'll try to unravel her past only to discover she might not be who she thinks she is. The narrative adapts to your choices which consist of keeping or erasing memories to define her personality. It features a noir-1940s atmosphere, single and multiplayer and several playbable characters, each with their own abilities. You can head to the official site to read more, trailer inside.